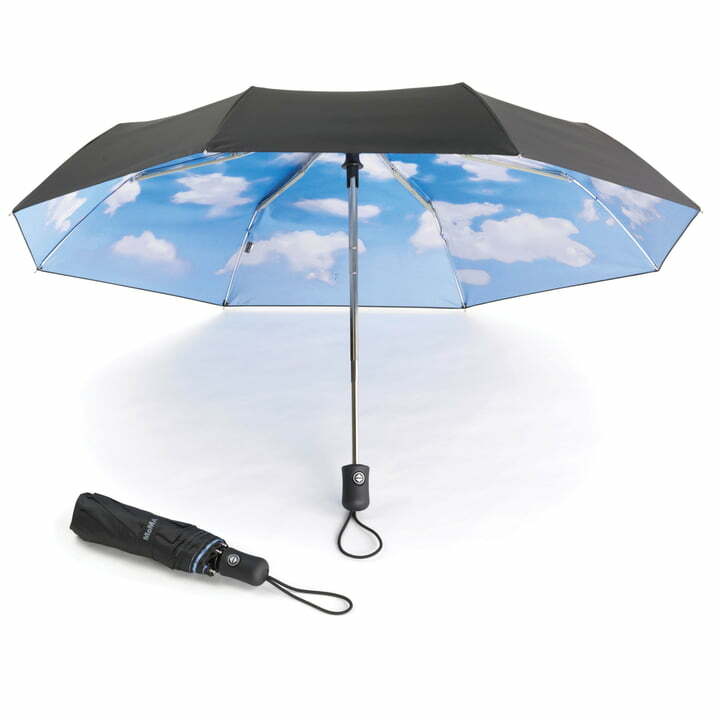 The imaginative MoMA Sky umbrella with the permanently friendly sky is world-famous. The umbrella inspires with a fancy interior and practical folding function. The Sky umbrella was designed by Tibor Kalman, who is well-known for his provocative optimistic graphic campaigns for Benetton. The blue, cloudy sky, which adorns the inside of the umbrella is a motif, Kalman showed among others in a Color magazine issue in 1995. A magazine, in which he acted as editor-in-chief. Thanks to its practical folding mechanism, the Sky umbrella can be folded in the blink of an eye and therefore be space-savingly stored - perfect for on the go. Single image of the Sky collapsible umbrella from the MoMA Collection in opened state and closed state with appendant case in black. The umbrella provides for a blue sky, even during bad weather.